You may only be cooking sausages, but the bunches of baked grapes make this dish look luxurious. Again, this is a dish that is special enough for a supper party. Saba is grape must. If you can’t find it (Italian delicatessens and some supermarkets stock it these days) use either vincotto or balsamic syrup mixed half and half with grape juice. Put the onion and celery in the bottom of an ovenproof dish that will hold the grapes and sausages in a single layer. Season and stir in 2 tbsp olive oil. 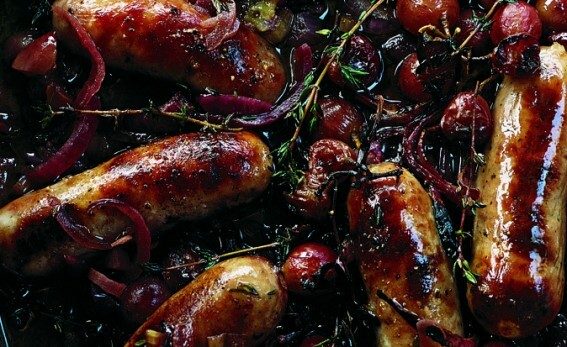 Lay the sausages and grapes on top (leave about half the grapes on their stalks – it just looks nice). Using a wooden spoon, crush about a third of the grapes so that their juice comes out. Tuck in the bay leaves. Season and drizzle a little olive oil over the grapes and sausages. Mix the wine with the saba and pour it around the sausages. Put into an oven preheated to 190ºC/375ºF/gas mark mark 5, and roast for 50 minutes, until cooked through. You can turn the sausages over halfway through the cooking time so that they get coloured on both sides.